Mike Richards had given up hope decades ago that he would ever find the Arkansas high school state football championship ring he lost on a church choir trip that traveled through Dodge City, Kansas. Richards, now a 52-year-old sheriff’s lieutenant, earned the ring in 1977 when he was backup linebacker and special teams player for the Benton High School football team. He lost it three years later during an overnight stay at a motel on the way to Colorado Springs. Well, it turned out somebody had been holding on to ring all those years. Teresa Runyan of Bonner Springs found the ring in a box of unclaimed items from the Silver Spur motel, where her father had been the head of maintenance. Runyan’s father died about eight years ago. His family has been trying to find the ring’s owner for the past five years. On Saturday, Richards and wife drove up about seven hours from Benton, Ark., to meet the Runyans, retrieve the lost treasure and treat them to a steak dinner. Richards realized the ring was missing the morning after he and other choir members swam at the Silver Spur in Dodge City 34 years ago. He and his roommates frantically combed through their motel room but couldn’t find the ring. As the bus pulled away from the motel, Richards continued to look through his personal items, and he asked others to look through theirs. The bus driver pulled over about 20 miles outside Dodge City so everyone could search their suitcases. No luck. Another search at the next motel was fruitless, too. “It probably got knocked off somewhere and somebody picked it up and put it in the lost and found,” Richards said. Richards said he eventually gave up hope. After graduation, Richards attended Henderson State University in Arkadelphia, Ark., on a football scholarship. He now works for the Saline County Sheriff’s Office just southwest of Little Rock. Every now and then, Richards still thought about the missing ring. Twenty years ago, he asked the company that made the ring if they could make him a copy. But the company had long since gotten rid of the mold and casing. After Runyan’s father died, family members went through his personal belongings in Dodge City, where they found the ring and other unclaimed items from the motel. Then last fall, Richards and some friends were at a high school football game when one of them noticed a post about the missing ring on the Benton High School website bulletin board. Richards had been on the website, but hadn’t paid attention to the bulletin board, he said. Richards soon contacted Runyan, whose grandson had posted the bulletin five years earlier. Richards wanted to drive to Bonner Springs, but the harsh winter forced him to wait until this weekend. Because the ring now fits only Richards’ pinkie finger, he plans to lock it away for safekeeping. “It might not mean something to somebody else, but the ring means a lot to me,” Richards said. The head coach arrived at Spartan Stadium Saturday for the Green-White game sporting some new bling. The Spartans — who as a team will receive their rings following the conclusion of the spring game — beat Stanford 24-20 in the 2014 Rose Bowl. Because the players are limited in the monetary value they can receive, their rings will be made of non-gold and the dimaonds will not be real. During halftime of the spring scrimmage, Michigan State honored the 2013 Big Ten championship and Rose Bowl championship team. Ever dream of owning a World Series ring from one of the Boston Red Sox’s three championships this decade? Well now you have a shot to own all three. The Grand Prize is a set of 2004, 2007, and 2013 World Series Rings; Second Prize is a Pair of 2013 World Series Rings; Third Prize is one 2013 World Series Ring. Each ring will be personalized with the winner’s name. The Red Sox Foundation will present a worldwide raffle of World Series rings for the next nine weeks. Raffle tickets, which start at $10 for 5 chances, are available online starting today, Wednesday, April 23, at 10 a.m. at redsox.com/ringraffle. The raffle will continue until Friday, June 27, at 11 a.m. . The raffle will continue until Friday, June 27, at 11 a.m.
Raffle tickets include more incentives with larger purchases. The ring raffle will be run by NetRaffle.org, part of the Celebrities For Charity Foundation, and Major League Baseball Advanced Media. Net proceeds from the raffle will help fund the award-winning programs of the Red Sox Foundation and help hundreds of charities throughout New England. While this is the third time the Red Sox Foundation has conducted a World Series ring raffle, it is the first to be conducted nationally and worldwide. After World Series victories in 2004 and 2007, the foundation raised over $1.9 million and $1.3 million, respectively, for the raffle of the 2004 and 2007 World Series rings to individuals in Massachusetts. 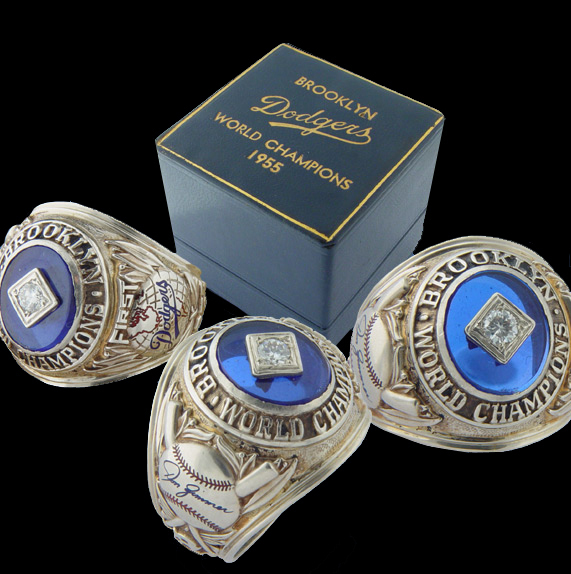 Hear the legendary broadcaster, in his own words, discuss the 1955 Brooklyn Dodgers World Series Rings. The 1955 ring was made by Dieges & Clust in 14K white gold. The ring had a beautiful single diamond and a really cool feature: Each ring has a blue facsimile signature of the ring owner, in blue, going across the sweet spot of a baseball. Each ring captured the signature faithfully and it’s one of the nicest world series rings ever made. It’s the Dodgers only world championship from their many decades playing in Brooklyn. Photographing professionally over 30 years, Scott Rovak is a photographer for the St. Louis Cardinals, St. Louis Rams and USA Today Sports. You can follow Scott on twitter Scott Rovak@scottrovak.